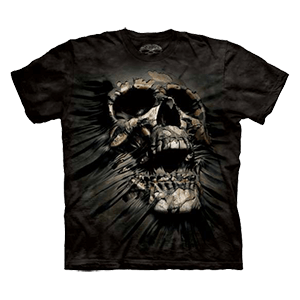 Nothing embodies iconic gothic style quite like the classic skull. The face of the skull is basically the face of death itself and, even unadorned, it is nothing short of classic in its appeal. 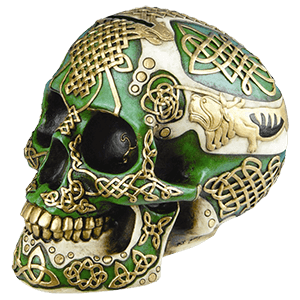 We show that there is a lot you can do with the skull, and we do so through our skull head statues category, where you will find dozens of iterations of this classic symbol. 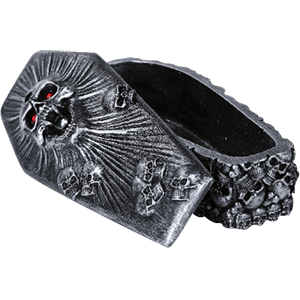 We offer the whole gamut of different skulls, ranging from the classic human skulls to demonic skulls and monster skulls of every shape and size. Our skull statues come in various colors, some painted to reflect the hues of bone while others are more metallic. Others still are more fantastic, lending the skull a coloration as eye-catching as its overall gothic shape! Some of our skull heads have horns, some have wings, and others still have fangs. Some look like demons, while others resemble vampires. Some are decorated with Celtic knots, while others are done up to resemble those who, in life, called themselves pirates, bikers, Romans, knights, and more. Some are infused with cyber designs and steampunk styles, while others have been made to look like they have withstood countless ages. Most of our skull head statues are smaller than the human skull in size, although there are some here that compare to the typical head-bone as well. 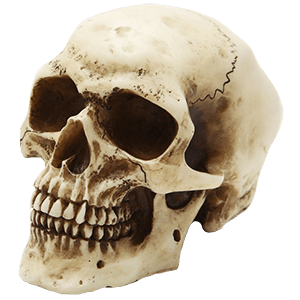 There is a skull statue here for any and every occasion, so no matter what you need the skull for, or why, you can bet that you will be able to find one to suit your taste and need, right here in our skull heads section. The eerie flickering of candlelight over bone is an iconic scene right out of horror, as well as an intriguing touch of style to add to any decor. 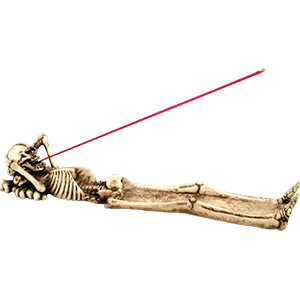 Real bone is hard to come by, though, and it also raises a lot of difficult-to-answer questions. 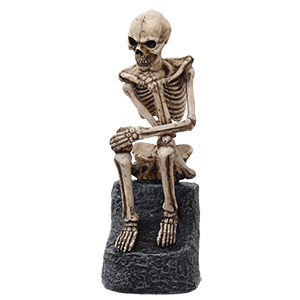 It is far better to avoid the hassle and get one of our skeleton candleholders instead! They look just as good as the real deal, while also being far easier to explain, should anyone question the skulls on your table - or the skeletons in your closet! Our skeletal candleholders range in their styles from the iconic skull and candle pairing to more ornate displays that combine skulls, bones, and more into gothic decor pieces that would look right at home in Count Draculas banquet hall! 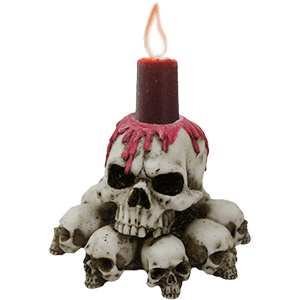 Many of our skull candle holders are made from cold cast resin, and many are capable of accepting candles of various sizes - from tea lights to taper candles and votive candles, and more. 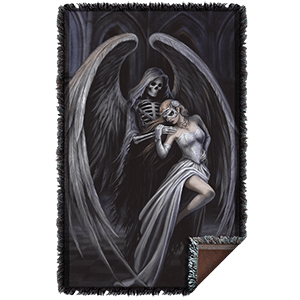 A few depict grim reapers and whole skeletons as they keep vigil over the flame, and one even features a skull bleeding wax out of its eyes! Skeleton hand candleholders and gothic, elegant candelabras stand side-by-side here, and all will bring with them an eerie design that adds ambiance to any room. A bit of eerie and creepy style is not necessarily a bad thing, and you will find that these skeleton candleholders are all a perfect way to bring some gothic ambiance to your decor, as well as great accessories for those who need some candlelight for their next midnight ritual. Grim yet often grinning, these skeleton and skull clocks are memento mori, or reminders of the fleeting nature of life. Impressive additions to home decor of all themes, our skeleton and skull clocks are perfect for anyone seeking an impressive and stylish way to bring gothic style into their setting. 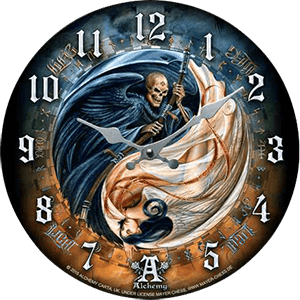 Many of our skull wall clocks feature the work of popular fantasy artists like James Ryman or Anne Stokes. Others are finely detailed desk clocks made of high quality resin and painted by hand. Watch as these analog skull clocks tick onwards towards oblivion, bringing eerie delight, dark artistry, or unique gothic charm to your office or home. Whether you are adding to existing gothic decor or seeking a way to start your collection, our skull and skeleton wall clocks are fantastic choices. Even the dead sometimes like to lean back and enjoy the finer things in life! And that has never been truer than with these skeleton incense burners! 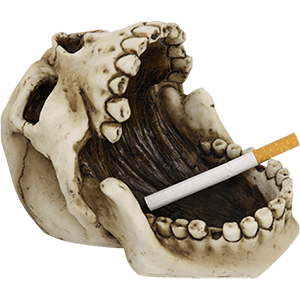 Ironically enough, incense is sometimes used to pay homage to the dead, and that makes these intriguing accents clever little decorations for any bone enthusiast to enjoy! 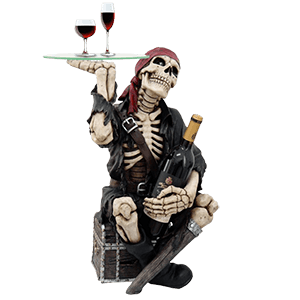 These skeleton home accents come in a variety of shapes and forms, ranging from more unique styled incense burners to classic boat style incense burners infused with skeletal style. Our boat style incense burners all share a similar form - long, with an ash catcher as most of their length - but also feature a variety of appearances, ranging from lazy grim reapers to relaxed skeletons out of their grave, to extended skeleton hands, to piles of skulls and more. 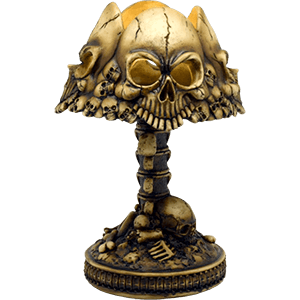 We also have a few more unique incense burner styles, including cone and pillar style incense burners that depict skulls, which, when used, will cause smoke to pour from the cracks and crevices in the design, creating a truly eerie yet appealing experience!